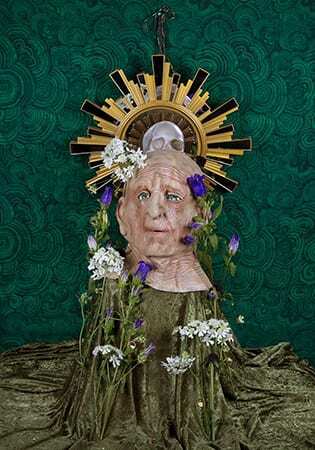 Mercer County Community College’s (MCCC) James Kerney Campus Gallery (JKCG) will showcase works by Rachel Stern in the exhibit “Orpheus Looked.” The show runs from Thursday, April 11 to Thursday, May 9. The community is invited to a reception and artist talk with Stern on Wednesday, April 17 from 5 to 7 p.m. The talk starts at 6 p.m.
JKCG is located in MCCC’s Trenton Hall, 137 North Broad Street, across the street from the James Kerney Building. General JKCG hours are: Mondays, 11:30 to 2:30 p.m.; Tuesdays, 10 a.m. to 2:30 p.m.; and Thursdays, 10:30 a.m. to 7 p.m. The gallery’s director and curator is Michael Chovan-Dalton, coordinator of the MCCC Photography program. According to Chovan-Dalton, Stern’s “Orpheus Looked” explores the classical narratives on tragedy and power in a way that allows the viewer to enter and reexamine these tales through the use of contemporary construction. “The images and the materials are both garish and luxurious,” Chovan-Dalton observed. “Stern works with historical and literary moral touchstones that have influenced and guided western culture for much of its history. Her treatment of these stories and events are meant to make us question our acceptance of normative roles, classic beauty, and conventional circumstances. A professor of photography at Columbia University, Stern received her BFA in Photography and the History of Art and Visual Culture in 2011 from the Rhode Island School of Design, attended Skowhegan in 2014, and graduated from Columbia University in 2016 with an MFA in Visual Arts. Her work has been featured in BOMB, ArtFCity, Hyperallergic, and Matte Magazine. More about Stern’s work is available here. Information about JKCG and upcoming shows is available on the JKCG website at www.mccc.edu/JKCgallery.